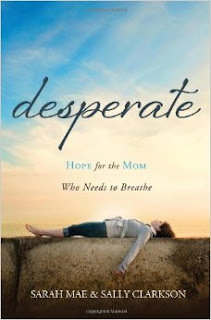 Last year sometime I was gifted with a copy of Sarah Mae and Sally Clarkson's book Desperate : Hope for the Mom Who Needs to Breathe. It was a kind gesture as I was feeling rather strained during the time period in which Bookworm4 was becoming part of the family. All the same, I set the book aside for a bit because I have a weird relationship with Sally Clarkson books and didn't want to dabble in it then. Clarkson's manner of speech can frequently grate on my nerves (I confess it) as I'm anti-nickname in general (e.g., "sweet one" or "dear heart"). I frequently feel like she's dismissing me and my frustrations when she repeatedly calls me (the reader) a sweet one; the major problem being that I typically don't feel very sweet. I mostly just feel like I want to get to the point. As I said, this book has been sitting on my shelf for a good year at least when finally, within these last few weeks, I began to feel a certain sense of, shall we say?, desperation in my mothering journey. ("Coincidentally", my feelings of desperation directly coincided with our launch into the new school year. But I digress . . . ) I jerked the book off the shelf, crawled into bed (not quite burying my head under the covers because I needed light to see the pages) and began to read. Words I had previously resisted hearing became like a hard driving rain on a dry and weary land. Suddenly every single word that authors Sarah Mae and Sally Clarkson had written down were filled with great meaning and I identified completely, soaking up all of the encouragement that they meant to offer. Eventually though I had to get out of bed again and live life with my family. This was a moderately challenging prospect but as is so often the case, after a good night's sleep and a good round of frustrated primal yells (ahem), life begins to improve. The desperate feeling subsides. The need to read the book felt like it was diminishing and then I found myself back with the Sally Clarkson that I'm used to. Being "deared" and "sweeted" began chaffing again, even though I know she means to be affectionate and loving. I'm left to think that my attitude towards Sally Clarkson is jaded and unfair. When I'm in need of great kindness and encouragement, she completely hits the spot. When I'm feeling alright I'd rather not read her. But that's me and definitely not her. It's my bad, if there is a bad. When your mothering soul is dry, Sally Clarkson is standing at the ready to fill your heart with positivity, launching you, once again, back on your journey. There's something to be grateful for in that, to be sure! As the subtitle of the book suggests, this book is all about offering drowning mothers hope and courage to keep on keeping on. Sarah Mae is a younger mother who begins each chapter with a letter to Sally explaining her feelings of the moment and then offers her words of wisdom to the readers. Sally enters in about halfway through each chapter with her response to what Sarah Mae has shared, as well as wisdom and insight of her own. It's an interesting layout and you have the benefit of two voices communicating certain truths instead of one. Although it's true that in a multitude of counselors there is safety, in the case of this book I would really have preferred to hear only one voice - that of Sally. The "problem" I have with Sarah Mae as an author is one that many others would probably ignore. Chiefly, I object to her age and lack of experience. At the time she wrote this book (2014), Sarah Mae's oldest child was six years old. Her youngest was three. While I do understand that her heart is to encourage mothers who are feeling weary in the journey, I find it a little hard to take from someone who is behind me in the mothering race. Not to say that people who have less experience parenting have nothing to share with me because that is absolutely not so. However, my personality, (and I think wisdom dictates this too), is one who is very careful and selective about who I go to for advice and counsel. When I seek someone out and ask for their help and/or opinion, it is with a remarkably determined intention to take whatever counsel they offer. Because of this, I tend to seek out people who are ahead of me in the game and who I have witnessed to have a proven track record in some regard or another. If I have a problem with my parenting (which I occassionally do, believe it or not!) I want to know that the advice I'm going to receive has been tested and tried. I didn't feel that much experiential wisdom was offered by Sarah Mae, although I would not for a second deny that she has wisdom. Personally, I wouldn't even think about writing a book at this stage of my life and I don't tend to seek out those who feel the need to talk before walking the walk, if that makes sense. It's nothing against Sarah Mae as a person, per see. It's about her age and level of experience. I also confess that it didn't help when she started talking about wanting to adopt and expressed her flowery feelings to that end. Having adopted - three times now - I see the subject more deeply and feel it more intensely than she does and I just couldn't take her seriously. Now, this issue of age and experience might not bother you like it did me. I wouldn't tell people not to read the book because it serves a useful purpose. I did appreciate the parts in which Sally Clarkson was doing the talking so I didn't chalk the read up to a total waste. At the same time, I also didn't mark down any passages that particularly stood out to me as being amazing. Generally speaking,this title is good on generic hope and encouragement. There's nothing wrong with that but it won't be one of those titles which I feel I have a good chance of re-reading. In the end, did I find it helpful? Well, I did get out of bed and I have kept my feet moving forward. But I'm still looking for a book on mothering to read alongside my Bible reading which will hit me where it really hurts and bring about some deep thought and conviction, and not just inspiration for a new day, if that makes sense. I kind of feel like Desperate was a bandaid when what I really needed was surgery. This daily dying to self thing and laying all of one's burdens at the cross is no joke. Necessary! But no joke. I feel like my feed are shuffling through some mud at the moment but I do know that God can and does use everything beautifully in His perfect time. Hard times are but for a moment and so we press on in that mothering goal, seeking to be the best mothers we could possibly be, correct? That's where I'm at. I've not yet read Sally Clarkson, mainly because I have an almost empty nest. But I have wanted to, both to see what she's all about and to see whether I would recommend her to younger mothers. I really chafe against being called those types of names as well. Sometimes a task we have begun takes on seemingly crushing size, and we wonder what ever gave us the notion that we could accomplish it. There is no way out, no way around it, and yet we cannot contemplate actually carrying it through. The rearing of children or the writing of a book are illustrations that come to mind. Let us recall that the task is a divinely appointed one, and divine aid is therefore to be expected. Expect it! Ask for it, wait for it, believe that God gives it. Offer to Him the job itself, along with your fears and misgivings about it. He will not fail or be discouraged. Let his courage encourage you. The day will come when the task will be finished. Trust Him for it. “For the Lord God will help me; therefore shall I not be confounded, therefore have I set my face like a flint, and I know that I shall not be ashamed” (Is 50:7 AV). I don't recall being bothered by the nicknames at all, but Clarkson is one of those writers that grates on my nerves at times, too. My issue seems to be when her children are quoted, and I'm left wondering how much paraphrasing is happening. That said, I usually do leave her books/posts(in small doses more often than not)with the encouragement I needed to make a more peaceful and beautiful environment for my children. There was one post recently on her blog that I found especially encouraging. I've actually been debating reading this one again. I seem to recall really loving it a few years ago. I like what you said about it being a bandaid, though. I haven't read any Sally Clarkson (that I know of), but I used to read Sally Mae's blog and enjoyed her thoughts. I really get what you're saying, though I think I have a bit more "tolerance" for Sally since I've heard her in person. I do think it's funny that I lumped my review in with another one--Sane Woman's Guide to Raising a Large Family by Mary Ostyn. It's much more practical but was just as encouraging to me. Well, you already know that I like Sally Clarkson, but "Desperate" is not my favorite of her books. It has its gems, but I found that one's biggest takeaway to be starting or joining mom support groups--which I agree is a great thing. Just not the first thing I think of when I am in my own desperate moments of motherhood. I also am wary of mothers writing books who are still in the early trenches of motherhood. I appreciate Sarah Mae's heart, though, and see her value in the book primarily as seeking out an older woman's wisdom and illustrating what that might look like. Everyone does have a message--it's just figuring out when is the time to wisely share it. I think unfortunately, today in our information age, we are swimming in a sea of messages that may be good, but premature. Personally, Sally's biggest appeal to me is that she models a life of integrity. I find her a great vision boost when I am languishing because she reminds me to pursue the ideals I love and the God who made them--to use a running analogy, to get back up and keep running that race...with joy! But I haven't found an all-encompassing motherhood book. Motherhood is such an organic and fluid experience that changes in different seasons, like our Christian walk. So I find wisdom gems in many sources that minister at different times, kind of like Barbara said about Elisabeth Elliot's writing. Hey, Carrie. I found your observations fascinating. I read the book some months back, and I confess to not having any strong opinions--or takeaways--regarding the book. I, too, am not a fan of being addressed by "dear heart," particularly by someone I don't know, and I nearly laughed out loud at your similar statement. @Sherry - Yes, indeed. That is why we keep reading! @Barbara - It's true I've had something of an aversion to Elizabeth Elliot. But it's also been over 10 years since I've read a single word by her and I think that I would be inclined to think of her teaching a little differently these days. I enjoy your self-disclosure and reading all the comments. I don't have an opinion on Sally. I *think* I read one of her books with a group years ago. Somehow, I seem to remember not being as wowed as expected. But I may remember wrong. @Annette - No, I have not yet read Unglued but it is also sitting on my shelf. (Has been. For awhile.) :D It was between Unglued or Desperate this go 'round.